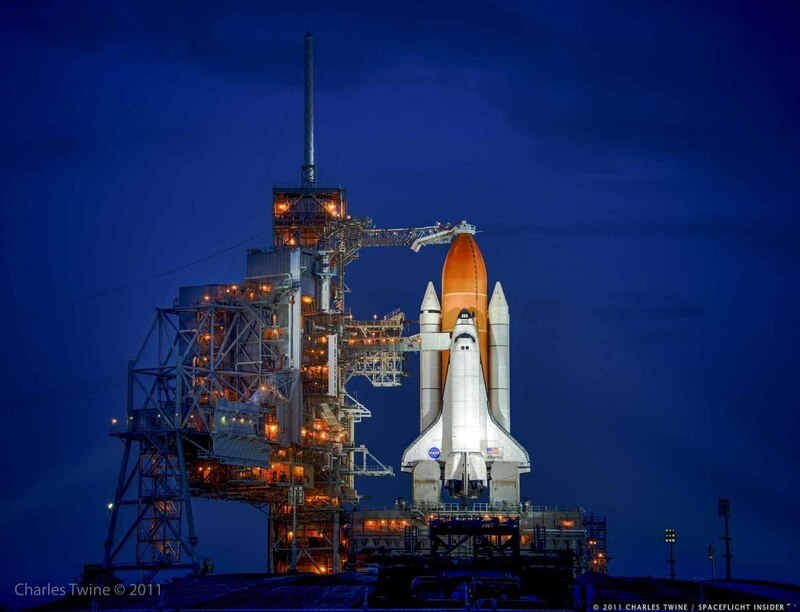 KENNEDY SPACE CENTER, Fla. — Launch Complex 39A began its third career after serving as the site for historic Apollo and Space Shuttle launches. Today it welcomed its first commercial launch, with SpaceX sending into space the Commercial Resupply Services (CRS) 10 Dragon spacecraft perched atop a “Full Thrust” Falcon 9 rocket. Liftoff took place at 9:39 a.m. EST (14:39 GMT) Feb. 19, 2017. It was cloudy and somewhat rainy morning. After providing a brief, fiery glimpse, the rocket disappeared behind a dense layer of clouds. However, the two-stage rocket refused to be ignored. The dense cloud layer caused the thunderous noise of its nine Merlin 1D engines, arranged in the “Octaweb” formation, to powerfully resonate. SpaceFlight Insider staff, atop the CBS News building, reported feeling the structure shudder under the might unleashed by the NewSpace booster. This was the second launch attempt, however. On Saturday, Feb. 18, the SpaceX team was working a couple of issues during an otherwise smooth countdown. The issue that ultimately resulted in the scrub of the attempt was an “out of family” reading on the second stage thrust vector control system. Batcheldor said he was grateful, however, to have had the experience of sharing the Feb. 18 launch attempt with space legends such as Buzz Aldrin, Al Worden, Bob Cabana, and John Grunsfeld. While the weather did not end up being a concern during the first launch attempt, for the second attempt, it was raining until about 45 minutes before liftoff. The cumulus cloud constraint remained no-go until about 25 minutes before launch. The soggy weather was reminiscent of the final Space Shuttle launch in July of 2011. 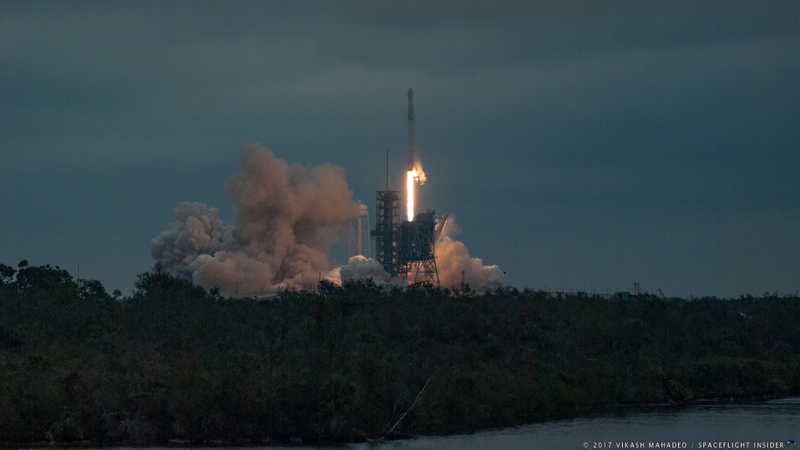 For that flight, however, the weather was expected to only provide a 30 percent chance of favorable conditions, while the CRS-10 mission had a 70 percent chance. In both cases, however, the weather cleared when it was most important. Fueling for the Falcon 9 began at approximately T-minus 70 minutes before launch for RP-1 (a highly refined version of kerosene) while the liquid oxygen began loading at about T-minus 45 minutes. The engines were chilled down for launch at T-minus 7 minutes. As is always the case with launches to the International Space Station, CRS-10 was on a tight schedule to be in the right place to catch up with the ISS. This is what is referred to as an “instantaneous” (one second) launch window. At T-minus zero, the nine Merlin engines crackled to life with an orange flame and sent the rocket skyward. Two minutes into the flight, the Falcon 9’s first stage separated and began its controlled return to Earth at T-plus 2 minutes, 41 seconds. 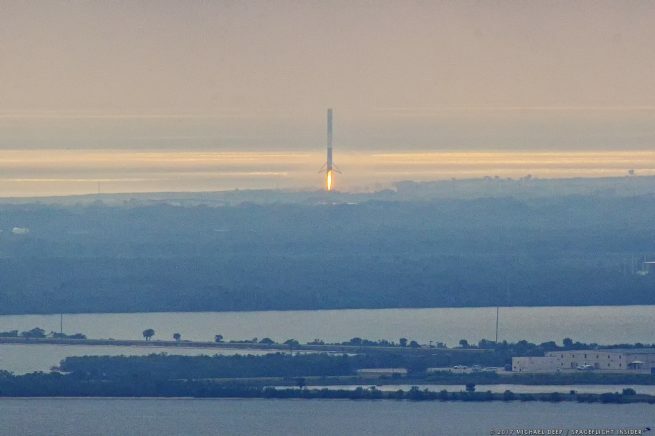 Following the stage’s entry burn at T-plus 6 minutes, 32 seconds, the Falcon 9’s first stage made its descent to Landing Zone 1 (LZ-1), formerly known as SLC 13 at T+8:32. The third ground landing took place 7 minutes, 33 seconds after lifting out of LC-39A. Sonic booms, like cannon shots, rumbled across the marshlands of Merritt Island Wildlife Refuge. The landing took place at 9:47 a.m. EST (14:47 GMT). After the first stage separated, the second stage burned for an additional seven minutes to place the CRS-10 Dragon capsule into orbit. The spacecraft separated from the booster at T+10 minutes and deployed its solar arrays at T+11 minutes. Dragon, now on its own, is expected to rendezvous with the orbiting lab around days later on the morning of Feb. 22 for capture and berthing with the outpost. The first Florida launch pad SpaceX received a license agreement to use was at nearby Cape Canaveral Air Force Station’s SLC-40 in 2007. Since 2010, SpaceX has launched 26 Falcon 9 rockets from that pad. 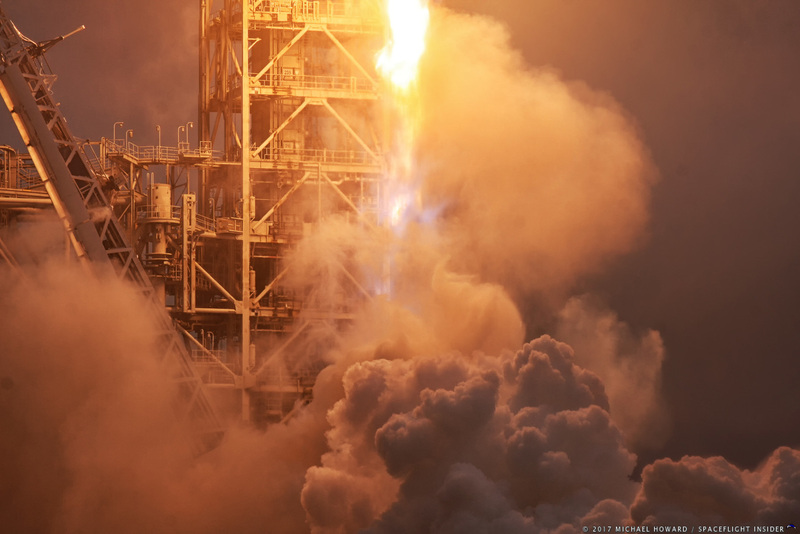 Additionally, the company has launched three Falcon 9’s from Vandenberg Air Force Base’s Space Launch Complex 4E in California, and now one from LC-39A. The HIF was built across the crawlerway originally laid out for the crawler-transporters NASA used during the Apollo and Shuttle programs. SpaceX will use the Shuttle-era Fixed Service Structure at the top of the pad mound, though the Rotating Service Structure, which was used to place a payload into the Space Shuttle’s cargo bay, will eventually be removed and reduced to scrap. “The hell we won’t,” Shotwell said. For today, however, a crew was not the focus. This mission was about ferrying cargo, crew supplies, and science experiments to the space station. 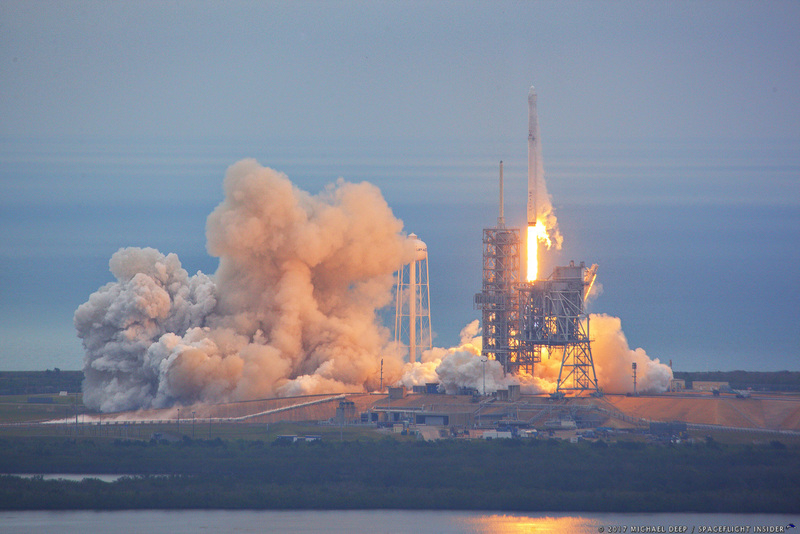 Schuermann’s students not only got to see this historic launch, they were a part of it as their experiments were included in the payload that roared to orbit on CRS-10 thanks, in part, to CASIS. You cannot deny that SpaceX is ahead of the game, even with their recent failures.